يشكل فندق Anchorage Motel Apartments بموقعه الممتاز في قلب City Center نقطة انطلاق ممتازة لاستكشاف تى أناو. يمكن من هنا للضيوف الاستمتاع بسهولة الوصول إلى كل ما تقدمه هذه المدينة النابضة بالحياة. إن سهولة الوصول من الفندق إلى المعالم السياحية الشهيرة الكثيرة في المدينة كمثل Te Anau Glow Worm Caves هو استثنائي بحد ذاته. يعمل Anchorage Motel Apartments على ضمان إقامة مريحة لضيوفه من خلال خدماته الممتازة وحسن ضيافته. يمكن للنزلاء الاستمتاع بالميزات التالية: واي فاي مجاني في جميع الغرف, مرافق مخصصة لذوي الاحتياجات الخاصة, واي فاي في المناطق العامة, صف السيارات, جولات أثناء إقامتهم في هذا المكان الرائع. يمكن للنزلاء الاختيار من ضمن مجموعة من الغرف المصممة بعناية لتعكس جواً من الراحة، والتي يتجاوز عددها 16. يقدم الفندق خدمات رائعة كمثل حديقة لمساعدتك على الاسترخاء بعد نهار طويل من النشاط والتجوال في المدينة. إن Anchorage Motel Apartments هو خيار ذكي بالنسبة للمسافرين إلى تى أناو، بما يوفره من إقامة هادئة ومرحة. 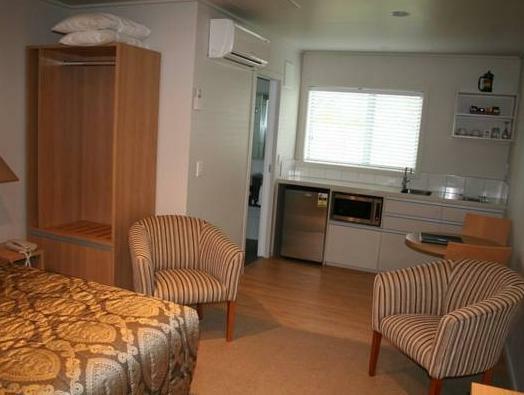 This motel is only one block from the waterfront and also an easy walk to the centre of town. The room was clean. The warm tiles and towel heater in the bathroom were a real luxury! The kitchenette had everything we needed for making some simple meals. We really appreciated the free, unlimited internet.We spent three nights here and would definitely choose this property again for a future stay in Te Anau. We had a great stay recently at the Anchorage Hotel, our first impression of our studio unit was very favorable. These unit appear to have been recently and very nicely renovated. The bathroom was lovely and the kitchen nicely appointed. The flatscreen tv's just added to the modern feel of the place. We stayed at the Anchorage Motel for six nights and we were very pleased. It proved to be a most comfortable studio unit, with a well equipped kitchenette, and a nice efficient bathroom with plenty of space for all our toiletries, a towel warmer and heated bathroom floor. . It is clean, well maintained. Also, in the back there is a little fenced backyard with red roses growing along the fence. Each unit has a small table and two chairs out there. We enjoyed having our breakfast out there, or linger over dinner with a glass of wine, while watching and listening to the birds. Very calm, quiet place, When we left I told the person at the reception that I wish all our rooms on this trip will be so nice and comfortable. The Anchorage owners were very friendly, very helpful with restaurant recommendations, getting around town, even route recommendations when we were leaving. They were readily available too. There was a guest laundry with one washer and dryer and free soap for the washing machine. They were full but there was not a parking problem. They are an5 minute walk into the Main Street of town and there is a pedestrian footpath where you can cut through to the middle or go up the other street to one end or the other. It was very clean with blow dryer, iron and ironing board, kitchen, good water pressure in the shower. No AC but it wasn't an issue for us in Nov although it was warm during the day outside. My only request would be to have a little shelf in the bathroom between the toilet and shower for our 'stuff'-cosmetic bags, etc. There was a DVD player and they had a lot of movies in the office. It was a good value. We were there 2 nights in room or unit 2. We only had an one night stay at the Anchorage, using it to stay while we visited Milford Sound (unfortunately the weather didn't cooperate with us, but that's another story). It was a nice and clean place, with plenty of room, in both bedroom and bathroom. The bathroom itself was a little dated, but still very clean. The room had a little kitchenette which we didn't use, but it gives you the option if you wish. The only issue was it's a fair way from the centre of Te Anau. If you have a car then it's not an issue but if you're on foot, then it's about a 10-15m walk. Double bed room size is just right. Wifi here is not usable seems it is global network problem here in Te Anau, coz cell phone signal is also weak. SkyTV subscription provided more interesting channel choices than the average NZ public channels. 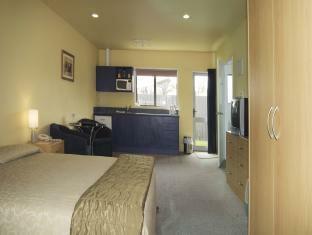 A great place to stay when travelling out to Milford Sound. Friendly, easy check-in & within a 10 minute easy walk to the Main Street. The room had everything we needed & an extra bonus was free sky TV & milk. Our only negative was the quilt cover had a suspect stain on the underside that we only found after waking up. Quilt needs a wash. It was a nice stay there where the small private garden behind my room did surprise me as there is BBQ machine there! The room is big and there is everything for you to cook your meal. There is also a bath tub which can allow 3 persons. Only thing not so great is that it is not located facing Lake Te Anau. Enjoyed our stay at the anchorage motel, loved the heated bathroom floor, appreciated the small touches likes salt and pepper in the kitchen, coffee for the coffee plunger and of course the free wi-fi. Just far enough away from any noise from bars in town but close enough to easily walk to both the lake & town centre for restaurants & shops. A warm welcome on arrival & a more than sufficient space in both living & bedrooms. 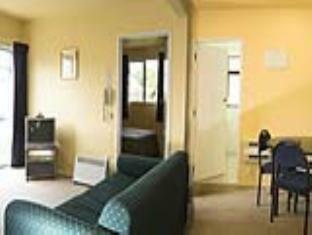 Three bedroom unit was actually a separate house two doors from the motel and was spacious and well appointed. The motel was one road back from the lake so there was no view but there was a shortcut down to the lake. The staff were friendly and helpful although we were two doors down in our own separate house so didn't see them except for checkin and checkout. Our house was warm and spacious with a full kitchen and the beds were comfortable other than the master only being a double. It was a good choice in an area where every other building is a motel. Very nice rooms, good shower, nice amenities. Very ecologically minded place. Owner was helpful in booking tours. They have bikes available for a donation, also a DVD library and book exchange. Laundry was a little expensive - $4 per machine. Really enjoyed our stay. Great being able to hire ski gear next door. Rooms are compact but comfy. Not enough storage space for clothes - dresser or suitcase stand would have been useful. Kitchen facilites very useful- lovely breakfast included was fantastic! mordern and neat rooms, tastefully done up. kids loved the trampoline in the garden. the rooms were compact but the architect had made perfect use of every space. beautifully designed and neat. floor of the toilet is heated which is a blessing in cold weather. we were surprised to find underfloor heating and heated towel rails in the room which were a nice luxury touch and we weren't expecting for the price. the bathrooms were 'five star standard'. internet was free and very good reception: something not so common in most motels. the motel is one street back from the lake(so nice and quiet) but no lake views but this was more than compensated for by the standard of the room. very handy to town and the shops. anchorage is located in the peaceful section of the main village. it is along a road full of motels, thus the traffic is not that heavy. it is a short walk over to the small village centre and the wafer front. the room is spacious and clean. traveller get a free flow of milk from the friendly host as well. if you are lucky, you get a free upgrade of room to one with a small jacuzzi! We stayed at the Anchorage for 2 nights and it was a great base for exploring Milford Sound. 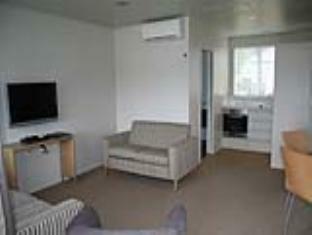 We had a nice self contained room with kitchenette and spa. The only slight inconvenience was that they ran out of hot water while we were half way through filling our spa on the first night so the spa was lukewarm, although this was OK on the second night. The guest laundry was also very convenient and cheap and it was an ideal opportunity to wash some clothes after 9 days on the road. 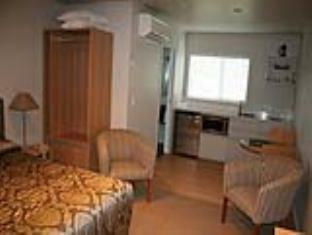 This motel is an excellent base for anyone on a self drive trip as it has just about everything you need. A Mid point to stay after or before you travel to Milford Sound. Just as a mid point for my stay after travelling back from Milford Sound. The Room is Ok. You can cook if you want. The bed is a bid too soft. But generally, the room is acceptable. No staff available after their office hours. The price is reasonable. even a motel in a small town can provide free wifi, that's why i don't understand why the other hotel/motel in other bigger cities have to charge for wifi. 2 thumbs up for free wifi. we stayed here for 2 nights and it was a comfortable and pleasant stay. everything is within walking distance in this small town, so location is not an issue. they provide sky tv with many channels which is a plus. watch the all blacks beat australia in the semis. i would recommend this place to all. it doesn't have a lake view but those hotel/motel with lake view charge so much more which is not worth it at all. Since it's winter, this is the best and properly heated unit for the family. Unlimited access to free WiFi. Very ideal place to stay in, would definitely stay here again if we go back there even if there's only a small group.